The ability to read and analyse old documents is a highly rewarding experience. The ‘Documentary Research’ element of the ‘Flodden Project’, presented an opportunity for this skill, called ‘palaeography’, to be taught to a team of in excess of 40 amateur volunteers. 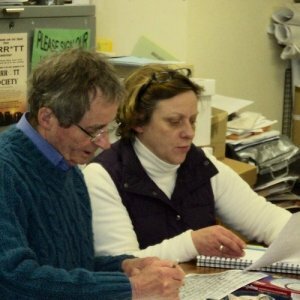 Following an intensive six week course led by Berwick Archivist, Linda Bankier, and a competency test, we volunteers set to work. Our task was to transcribe, deconstruct and analyse a variety of primary and contemporary documentary sources. The aim of the transcription process was to identify new information relating to the Battle of Flodden that took place in 1513 between Henry VIII of England and James IV of Scotland, and the associated period of history. In this respect the project exceeded expectations, with new evidence coming to light, discovered by many fresh pairs of eyes. The sources examined were digital copies of original documents ranging from descriptions of the battle, extracts from financial accounts, distribution of the ‘spoils of war’, to letters - one of which was from James IV himself. The ‘Documentary Research’ articles in this book, give a taste of what has been gleaned from a selection of these documents. Hopefully, it will whet your appetite to delve deeper into what is a fascinating period of cross border history. This project was an excellent example of public participation in history at work. That is to say, the history of the people, for the people, and in this case, by the people. Although the research was supported academically, it was undertaken and delivered exclusively by amateurs with little or no prior expertise. The volunteers, both men and women came in all ‘shapes and sizes’ with varying degrees of ‘life experience’. Everyone who was willing to learn and commit to the project was made most welcome. It was a collaborative process, with volunteers working together as a whole and in small teams. The ‘grey cells’ were given a thorough workout whilst new and lasting friendships were being made. Palaeography is a highly transferable skill, that once acquired, can be applied across many areas of research enabling future interaction with the past. Indeed many of the volunteers continue to share their time and new found expertise, by helping others in a variety of community based historical activities, led by Berwick Record Office. However, the success of any project is largely dependent on its leader. In this respect, archivist Linda Bankier once again reigned supreme. Her continued support and encouragement kept us all motivated ensuring the project was delivered on time. I am sure many of my fellow volunteers will join me in thanking both Linda and the Heritage Lottery Fund for making this project possible.